In this paper, by using porosity notion for subsets of natural numbers at infinity porosity lower and porosity upper bound of real valued sequences will be defined. By using these new notions, definitions of porosity infimum and porosity supremum will be given, respectively. For a given sequence, the equivalence of porosity infimum and porosity supremum is necessary and sufficient condition for to existence of porosity convergence but it is necessary, not sufficient, condition for to existence of usual convergence. Altınok, M., Dovgoshey, O. and K¨uc¸ ¨ukaslan, M., Local one-sided porosity and pretangent spaces, Analysis, Vol:36, No.3, (2016), 147-171. Altınok, M. and Küçükaslan, M., On porosity-convergence of real valued sequences, An. ¸Stiin¸t. Univ. Al. I. Cuza Ia¸si. Mat. (N.S. ), Accepted 2016. Altınok, M. and Küçükaslan, M., Porosity Limit and Cluster Points of Real Valued Sequences, To appeared. Denjoy, A., Sur une propri ´ et ´ e des s ´ eries trigonom ´ etriques, Verlag v.d. G. V. der Wie-en Natuur. Afd., Vol:29, (1920), 220-232. Dolˇzenko, E. P., Boundary properties of arbitrary functions, (Russian), Izv. Akad. Nauk SSSR Ser. Math., Vol:31, (1967), 3-14. Kaya, E., Küçükaslan, M. and Wagner R., On Statistical Convergence and Statistical Monotonicity, Annales Univ. Sci. Budapest. Sect. Comp., Vol:39, (2013), 257-270. Khintchine, A., An investigation of the structure of measurable functions, (Russian), Mat. Sbornik, Vol:31, (1924), 265-285. Küçükaslan, M. and Altınok, M., Statistical supremum-infimum and statistical convergence, The Aligarh Bulletin of Mathematics, Vol:32 No.1-2, (2013), 39-54. Thomson, B. S., Real Functions, Lecture Notes in Mathematics, 1170, Springer-Verlag, Berlin, Heidelberg, New York, Tokyo, 1985. ISNAD Altınok, Maya . "Porosity Supremum-Infimum and Porosity Convergence". 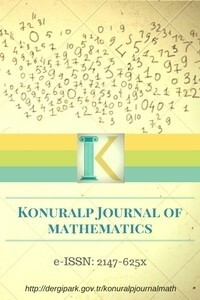 Konuralp Journal of Mathematics (KJM) 6 / 1 (April 2018): 163-170.